When designing the interior decoration of a larger space, it is important for the room to feel cozy, while maintaining the flow of openness. Here are some tips on making a large room have the perfect balance! Depending on the shape of the room, or where windows are placed, you may easily divide up areas of a larger room with and L-shaped sectional. In addition, you may even compliment your sectional or sofa with an oversized ottoman. The perfect way to create environments for lounging in a larger room are to align your furniture atop an area rug. Use the rug to define the borders of a particular zone for sitting or laying. Placing a day bed or chaise lounge chair in the center of a large room can be the perfect divider between different areas. If your living room and dining room are conencted in the same large space, separate them with the bold placement of a larger piece of furniture. A wooden or paper Japanese screen can be used for shade, privacy, or be a means to section off different areas within a larger space. Create a reading nook, or separate your dining area from the main living space by placing a screen between the two environments. If you’d like to tone down the openness of a large room, or simply give it a little warmth and character, try adding an accent wall showcasing your favorite pigment. Use a color that is calming and comforting, but makes a statement nonetheless. 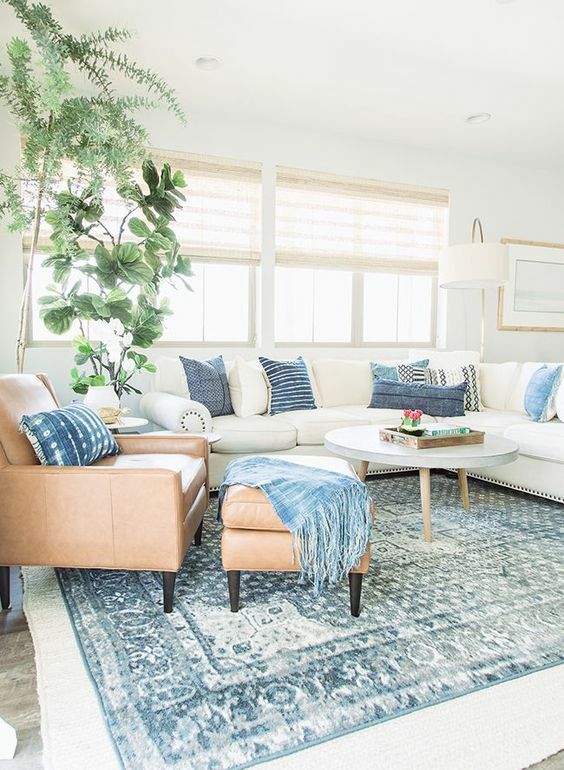 A perfect way to fill a large room with warm, earthy energy is to place taller house plants along the edges of your furniture, in corners, or on side tables. Try a potted ficus tree, a majesty palm, or Madagascar palm to fill out your environment with forest vibes.